Erdkamp Motors celebrated their 75th anniversary Friday night with an open house. 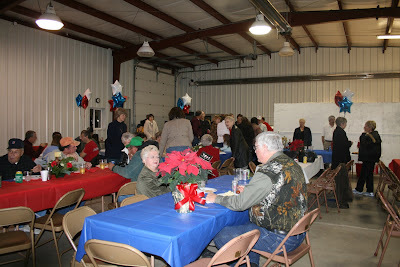 A large crowd enjoyed food and drinks along with some beautiful cars, a little history and generous hosts. It all began when R. D. Erdkamp started with a franchise for Dodge and Plymouth vehicles in June of 1934 in downtown Exeter. In 1946 after World War II, R.D. moved the business to the current location into buildings he built on East Seneca Street in the 1930’s. The business has always been in the family with R.D.’s sons, Don, Robert and Leonard joining the dealership in 1946. During that year they also added their current shop on the west end of the building. The three generations working together was short lived as R.D. passed away at the age of 86 in 1971. In 1982 Don retired and sold the dealership to George and his with Kathy who own and operate the business today. In 1977 the Chrysler franchise was added with Plymouth back on in 1991 and Jeep and Eagle in 1992. George’s son Adam noted they were at one time “a six line dealership. We had Dodge trucks, Dodge, Jeep, Eagle, Plymouth and Chrysler.” Eagle and Plymouth were phased out in 1998 and 2001 and currently the dealership sells and services Chrysler, Dodge and Jeep. In early 2004 the dealership again became multigenerational as George and Kathy’s son, Adam and his wife Becky, returned to Exeter and Adam joined the family business. He is the fourth generation to be involved in the dealership. The closing of nearly 800 Chrysler dealerships nationwide this summer definitely made for some tense moments in the dealership, “It was interesting with all the closing. We had some doubts and were hoping it wouldn’t happen. No one knew the formula,” said George. As the lone new car dealership in Fillmore County and one of the few remaining Dodge dealers in the area Erdkamp Motors plans to be around for at least 75 more years.